Florida's Emerald Coast Is Beautiful! 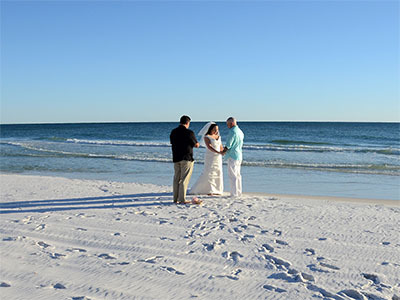 We specialize in intimate beach weddings and vow renewals of all sizes and enjoy the simplicity and symbolism of a couple in love, married at the water's edge. 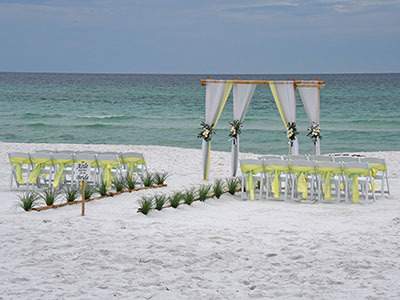 Planning a wedding at the beach can be a very exciting experience! We are romantics and love seeing a couple get married in these beautiful surroundings. We feel we're part of your lives and want you to have your dream wedding. 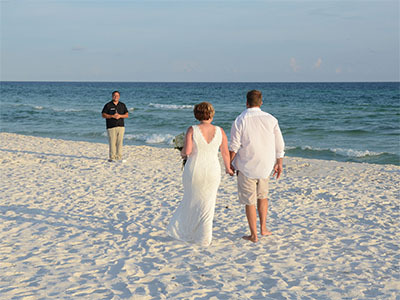 We have photographed and officiated hundreds of weddings here on the beach. Each with it's own style and character. 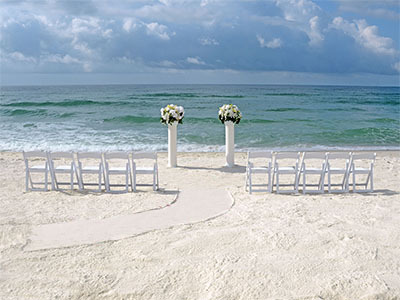 Let us use our expertise to give you the low-stress destination wedding of your dreams. Servicing North West Florida's Emerald Coast on the Gulf of Mexico. We're very familiar with the areas we cover and we'll talk about what areas need permits or have special requirements. We're professional photographers foremost. We want to make your day special. We bring professional enthusiasm and energy to your wedding. Go HERE for a slideshow with many examples of our work. Your edited photos will be available to you in a password protected online gallery, download link, and USB thumb drive with copyright release. 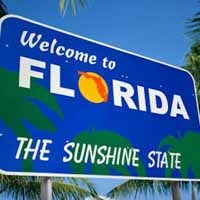 It's a very simple process but does require you and your fiancé to go to a local Florida county clerk's office during government hours (no weekends or holidays). 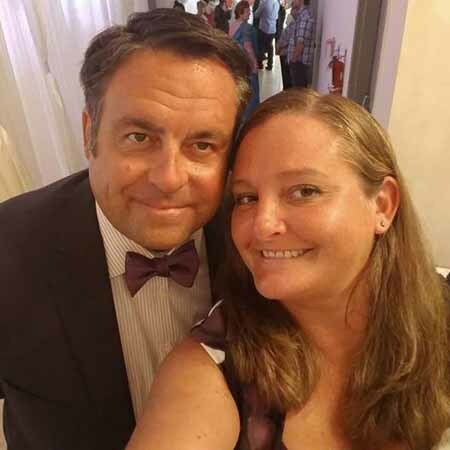 We'll talk specifically about this, but we like to mention it so you can plan for this in your travel and deciding on what day you want your wedding. Clerk locations and more info HERE. Call, Email, or Text us to ask questions, look at dates, and talk about details for your wedding. Our booking process is simple and we provide you lots of info about your wedding to get you started. We accept all credit cards, Paypal, and checks. We check in with you regularly leading up to your wedding day and are accessible for questions and advice. 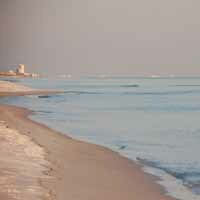 We are licensed and insured to work on our beaches. 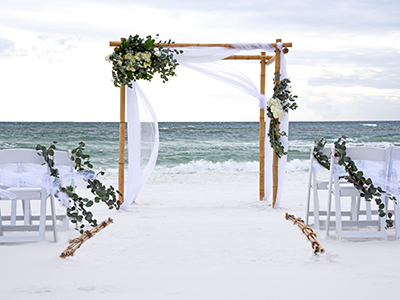 Eloping to the beach is exciting and adventurous! 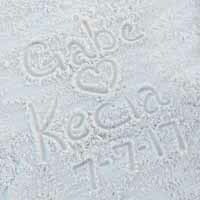 We don't mind planning quickly, call text or email to discuss plans or visit our elopement website for simpler options. 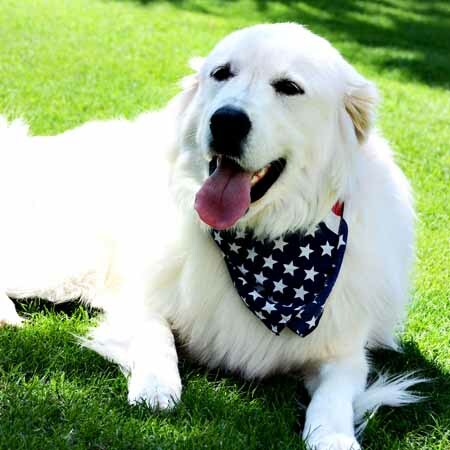 Our packages are flexible and deposits are part of the total cost. 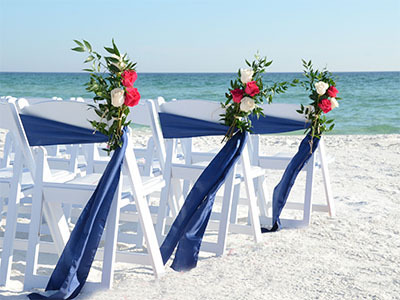 What are the steps for planning a destination wedding at the beach? All of the beaches here are beautiful! Each beach community has it's own style and character. ​We're up in the Panhandle of Florida, the Northwest portion on the Gulf of Mexico that's under Alabama. 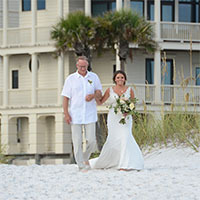 We cover from Mexico Beach, Panama City Beach, 30a, through Destin, Okaloosa Island (Fort Walton Beach), Navarre, and Pensacola Beach to the West. 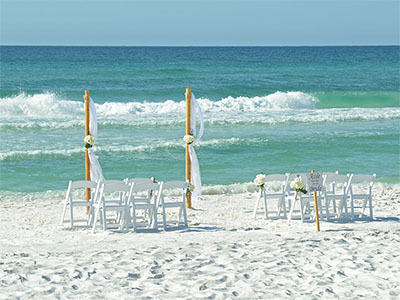 Now that you know when you'll be here and what day your wedding is, it's time to find your lodging. Do you want a beach house, condo, hotel? There are lots of options in a range of prices in our area, use our vendor list for ideas or stay somewhere familiar if you've been here before. Once we know where you're staying, we'll use our knowledge of the area to make a recommendation on the best spot for your wedding. 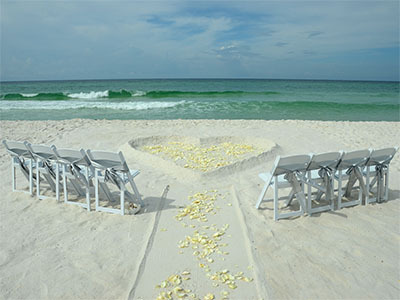 We think having your wedding right where you're staying or as close as possible is ideal. 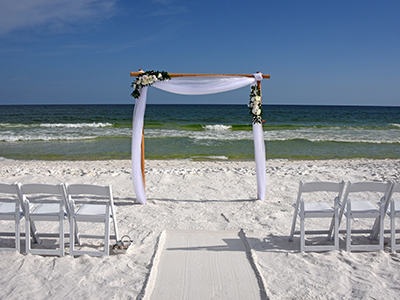 When looking at lodging on the beach, you'll always want to ask if weddings are allowed and if there's a fee. We provide the things needed for the ceremony itself. 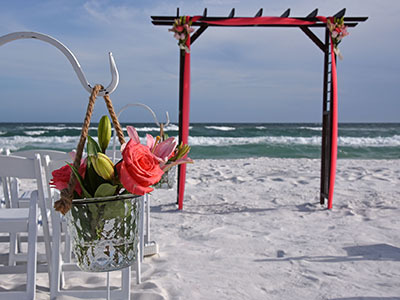 Officiant for the ceremony, photography, decoration, and ceremony coordination. 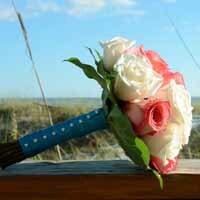 You may want fresh bouquets and boutonnières and a hair or makeup stylist. Use our vendor list to get suggestions for this and more..
You have most of your plans in place, what are you planning for after the ceremony? 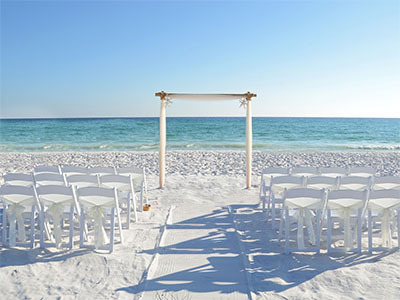 The beach wedding doesn't have to be as traditional as plans back home. 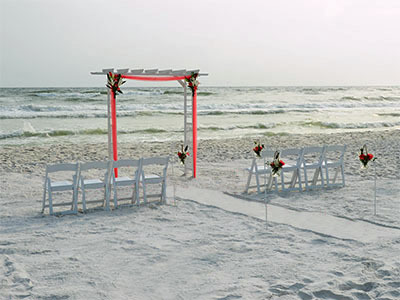 Many couples reserve space at a local restaurant, some have a party on the beach. Use your rental to host a party, most condos have party rooms they'll rent or include. You can choose how much of this you'd like to do yourself or hire people to help you. Once again, our vendor list has ideas for these services. 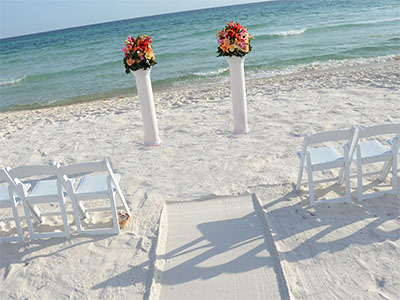 Sunset Beach Weddings is an independently owned small business. The Grande Bamboo package allows you customize the colors and options to make it your style. Check out these photos for ideas on building this package. Fresh flowers add a refined touch to this wooden arbor. Simple version of our Grande Bamboo package. A classic crisp look for the beach. 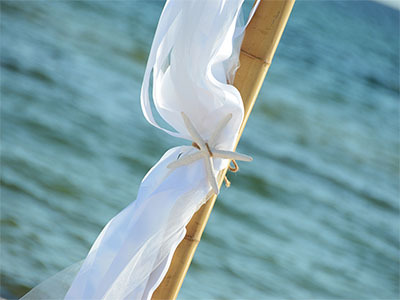 Streamers move in the wind and look great on the beach. Petals from fifty fresh roses form your heart. A simple water's edge option. This package is intended for the couple with minimal or no guests and is typically only available for evenings (mon-thu) and all mornings. Additional choices (many of these are already included in the packages above). Chairs: $7 each - can be added in any number. Sashes for Chairs:: $3 each or $5 for double sashes. Slipcovers for Chairs: $2 each - look great with sashes and double sashes. Ceremony Music: $75 - includes songs for guests, processional, and recessional (your choice of songs). Deluxe Sand Unity: $75 – larger than our standard sand unity, some couples love to have their kids, family, or even wedding party participate! 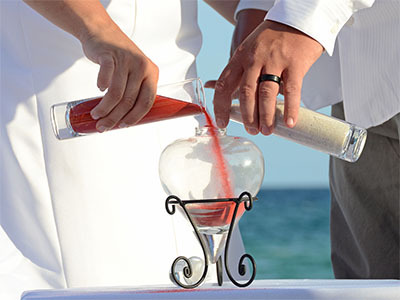 Decanter is yours to take with you after your ceremony. Bouquet & Boutonnière: $85/$15 - we can provide rose bouquets (dozen roses) in various colors for $85 and matching boutonnières for $15. If you need something more intricate or elaborate, use our vendor list to find quality florists. Pre-ceremony Photography: $150 - before your ceremony begins (1 hour with wedding party, getting ready, etc). 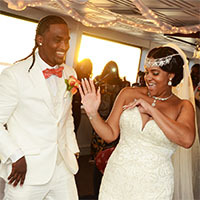 Reception Photography: $200 - 1.5 hours capturing the significant reception events. Family Beach Photos: $150 - coming back to the beach or your guests want family photos? We love seeing your family again! A 30 minute session with your family on the beach. With your edited photos, receive online shareable gallery and personal download link with copyright release. Seagrass Aisle $50 - add seagrass to your smoothed aisle for color and texture. Shepherd's Hook Lantern Aisle: $75 - shepherd's hooks with hanging hanging white lanterns (6 total) on each side of smoothed aisle. Seagrass may be added to the base of each hook. Shepherd's Hook Hanging Fresh Flower Aisle: : $100 - shepherd's hooks with hanging fresh flowers (4 total) on each side of smoothed aisle. Tiki Torch Aisle: $75 – pairs of decorated tiki torches aside smoothed aisle with grass at the base of each may be added to any package (4 total). Bamboo Aisle: $100 - smoothed aisle with rope lashed bamboo runners and seagrass may be added to any package, looks great with the Tiki Torch Aisle! 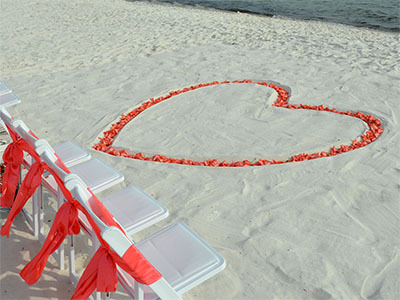 Inverted Rose Petal Aisle: $100 - similar to our inverted heart in the sand, the aisle is smoothed and dug out, lined with 4 dozen fresh rose petals in your choice of color. Is a great add-on for any package. Fresh Arrangements $10 each - on aisle Chairs and Arbor/Streamers.